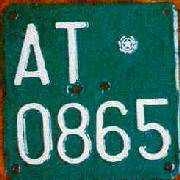 1959-1985: green plates had been since 1959 used until 1985 for agricultural vehicles. They were perfectly square, at the beginning they were made of metal (picture number 1) and after 1963 of plastic (pictures number 3 and 4) like plates for cars. 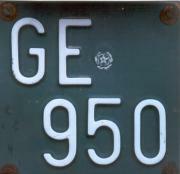 The first two letters are the origin code; then there was the seal of the Italian Republic and last there was a serial number: if the number was lower than 1000, there usually were leading zeros (picture number 1), even if in some provinces these were never used (picture number 3); moreover, if the number was made of 5 digits, the first one was placed on top and the others on the second line (picture number 4). 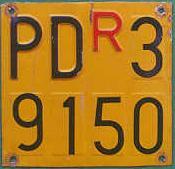 In the first row you can see a matched couple of agricultural plates: the second one has got an "R" that stands for "rimorchio" (trailer) and was the repeater plate attached to the trailer. The fifth picture (sorry if the picture isn't very good) is a lateral trailer plate and has got the print "RIM. AGR." that stands for "Rimorchio Agricolo" (Agricultural Trailer). 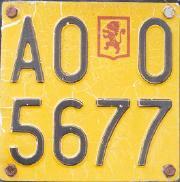 1985-1994: from 1985 black on reflective yellow plates with the same numbering system were used as you can see in the picture number 6. Also repeaters and plates of trailers had the same change of look, as you can see rispectively in the pictures number 7, 8 and 9. 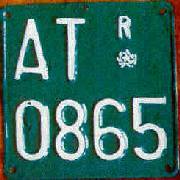 The first of these became made with adhesive numbers over a base with a red "R" in place of the symbol of the Italian republic. 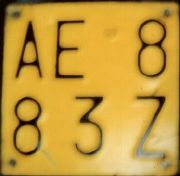 1994-Today: in 1994 agricultural plates changed the numbering format, exactly like work vehicles: they haven't got the origin code any more and it's replaced by two serial letters and the last digit of the number is substituted by a letter (pictures number 10 and 11). 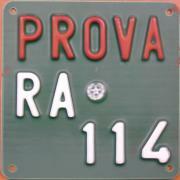 Test plates: test plates for agricultural vehicles were introduced in 1959 and at the beginning they were rectangular or square, had a green background, the print "PROVA" in red on the first line, followed by the origin code and the seal of the Italian republic and a serial number in white on one or two lines (pictures number 12 and 13). 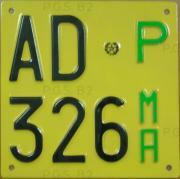 In 1985 test plates for agricultural vehicles became as the plate that you see in the picture number 14, with the letters green "P", "M" and "A" in column. 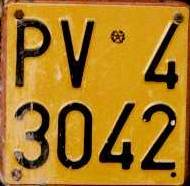 The "P" stands for "prova" (test), while "MA" means "macchina agricola" (agricultural vehicle). 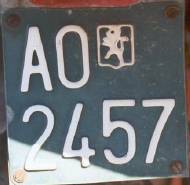 These plates changed their format in 1994, like all Italian plates, and the origin code was replaced with two serial letters, even if the global look of the plate didn't change (picture number 15). 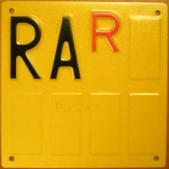 Since 2003 the normal test plates used on all other vehicles have been used also for the agricultural vehicles. Aosta: agricultural plates from Aosta, like the normal plates for cars, have got a special coat of the arms, as you can see in the last two pictures that show plates of different kinds. But if you want to know more about this symbol, go to the page of plates from Aosta. Many thanks to Giancarlo Raposo who sent me the first two pictures, to Adolfo Arena for the picture number 3, 8, 11, 13 and 15, to Alessandro Libanore for the pictures number 4 and 12, to Marcello Taverna for the pictures number 5, 6 and 9, to Paolo Troncatti for the number 7, 16 and 17, to Claudio Blanchi for the number 10, and to Louis Fierens for the number 14.